Ideal Aprons for men, Aprons for Women. Black apron with White 'Darth Baker' Logo. An idea kitchen apron for anyone who loves cooking, baking. Give your guests a giggle when cooking or BBQing with friends. Ideal for Star Wars fans who love cooking, BBQs or baking. 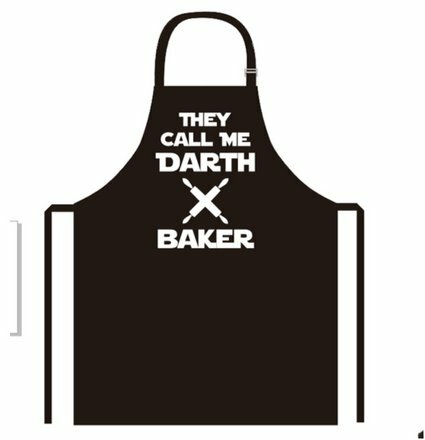 Treat yourself or make this apron the perfect gift along with our matching 'Darth Baker' Spatula set. 35% Cotton 65% Polyester. Wash at 40 degrees. Do not use bleach or the colour will change. We offer a 100% money-back guarantee so you can buy with confidence. Your satisfaction is our priority and returns or exchanges are made easy through Amazon. Funny Apron For Men and Women. Treat yourself, or make this baking apron the perfect gift for men or women on Father's Day, Mother's Day, Valentine's Day, Christmas, birthdays, anniversaries, retirement, or for no reason at all! Ideal for Star Wars fans who love cooking, BBQs or baking. Universal Size with Adjustable Neck. Ties at the waist and fits waist up to 60"
If you have any questions about this product by Positive Products Ireland, contact us by completing and submitting the form below. If you are looking for a specif part number, please include it with your message.